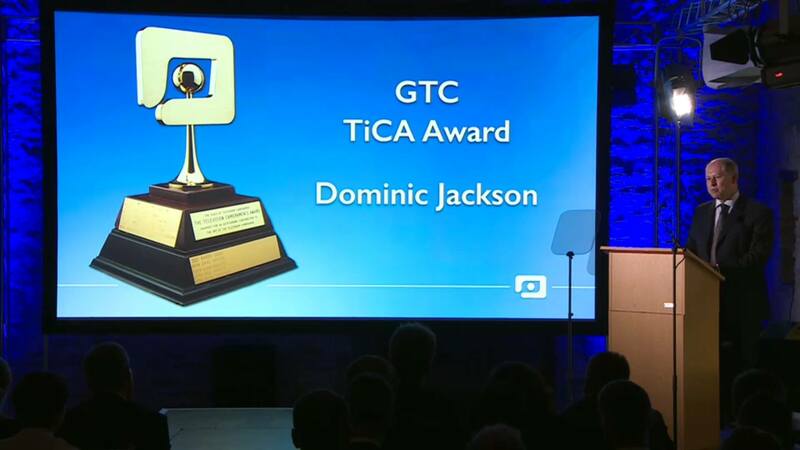 The finale of the GTC's great Day in the Country on Sunday 18 May was the presentation of the GTC Awards 2014. The quality of all the Award winners was exceptionally high this year and the evening was additionally imbued with a heartwarming spirit of generosity and compassion due to a special award given in commemoration of exceptional news cameraman Mick Deane, tragically shot in Egypt last year, and also a presentation from Paul Pirie from industry charity CTBF with GTC member Chris Yacoubian, a recent beneficiary from the industry charity during a time of serious illness. Below is an abridged transcript of the script from Sunday's presentation. The name of Dominic Jackson has been synonymous with Steadicam for 20 years and he has played a major part in establishing this mounting as a preferred tool in the live multi-camera genre. Dom works in Entertainment, Drama and Features and has long been a first choice when looking for an experienced quality Steadicam Operator. 10 years of Big Brother, Strictly Come Dancing, various National Theatre live cinema casts. Dominic was also at the forefront of live 3D in the UK building a 3D steadicam rig, which was used on Royal Opera House productions of Carmen and Madam Butterfly, the Strictly 3D final, Got To Dance 3D and the Royal Wedding for Sky. His work also featured in another nominated programme this year, Bollywood Carmen live. 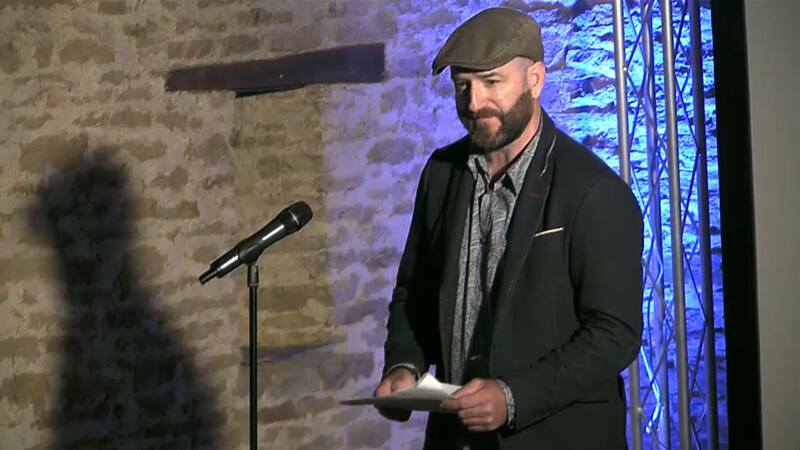 This year’s successful nominations covered an amazing range of exquisite quality of work across all TV genres, reflecting the vital contribution and hard work of all those who use a camera in news, documentaries, drama, sport, live and recorded studio programmes. The first of the studio based trophies features the music numbers from C4’s Alan Carr Chatty Man. These numbers were shot by Nat Hill and his crew, and are recorded almost always in one take in front of a live studio audience. The series never failed to produce inventive sequences that didn’t ever detract from the performer. The awards were collected by Steve Inchmore, Gemma Partridge, Dave Emery and Pat Mehanna, all part of Nat’s regular crew. The judges commented on how modern technology had been used in conjunction with inventive camera hides to produce an excellent end product. The nomination cited wonderful photography in very harsh environments. 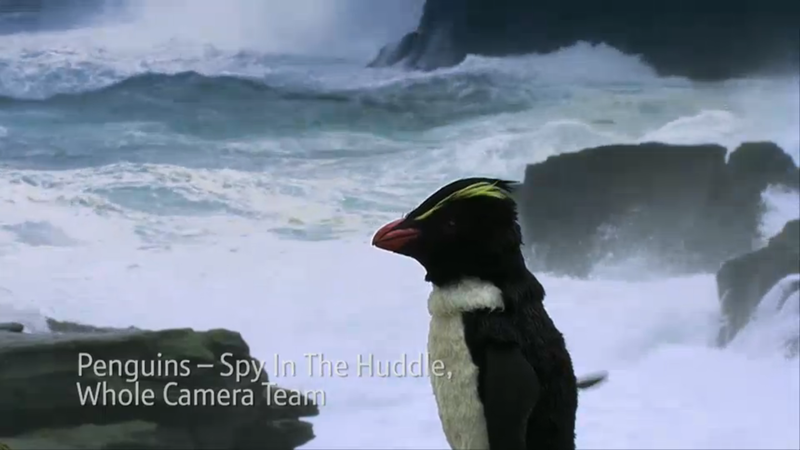 Fantastic, really intimate moments with the penguins, particularly the use of super slo-mo, underwater camerawork in freezing oceans and the innovative use of minicams with egg cams and motorized penguin cams – at one point so lifelike that one penguin tried to instigate courtship with the mock-up! 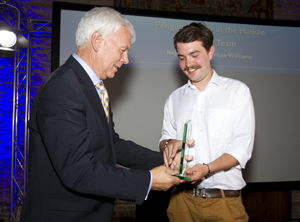 The award goes to the whole camera team from John Downer Productions and representing them was Huw Williams. Peaky Blinders was a beautifully shot grown up drama that centred on a period of history in 1920s Birmingham’s tough, sometimes lawless, streets. The nomination stated that George Steel’s masterful use of limited depth of field, especially in big close-ups, was reserved for the occasions when it really counted rather than being over used. From dark, gritty scenes of violence through to tender, passionate love scene, his camera caught the mood perfectly. The Award goes to Director of Photography George Steel. Next a documentary series that featured an area in the UK that few of us will ever visit sothe gorgeous landscapes and lifestyle stories made for a thoroughly entertaining series. The nomination highlighted excellent photography capturing the wild and rugged landscape. 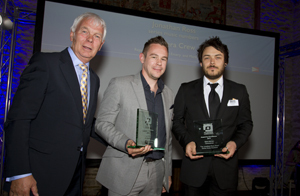 Unfortunately the camera team could not be there to collect the award. Back to studio music, but this time on ITV1 although also under the leadership of Nat Hill. Some very ambitious shoots were recorded in front of a live audience, most of these in single takes and some even just a single shot. The nomination singled out the jib shots by Dave Emery as particularly well planned and executed, but every week saw new, interesting and inventive coverage. 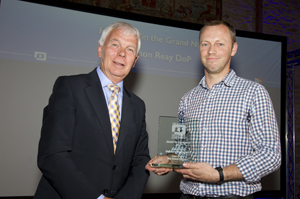 The Award was received on behalf of the crew by Dave Emery and Mark Marven. A really entertaining documentary repeated just before this year’s Grand National race that used delightfully shot interviews, race footage and studio set pieces to make a thoroughly enjoyable hour of TV. The nomination called this a very interesting subject and the coverage was considered unique, inventive and very apt, from talking heads and establishers to the varied and quite incredible use of slow motion. The needs of the production were obviously analysed at great length and delivered in a way that was both illustrative and also quite beautiful. 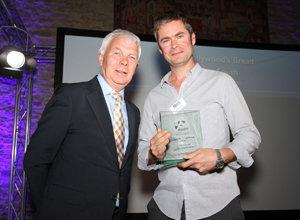 The Award goes to Director of Photography Simon Reay. 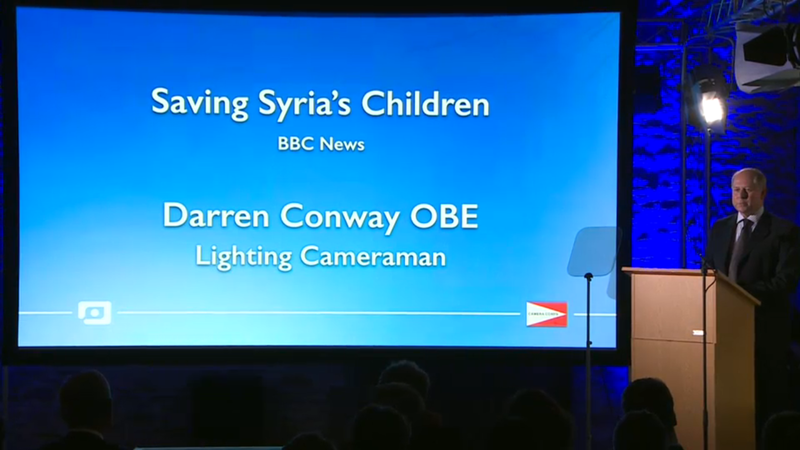 Now to some of the most dramatic news pictures shown on BBC1 last year from one of the world’s major war zones – Syria. The shots in this nominated programme added to the very moving story but in a really professional way; the camera was never intrusive and the subjects appeared completely relaxed while they were being photographed, even under the most trying of circumstances. 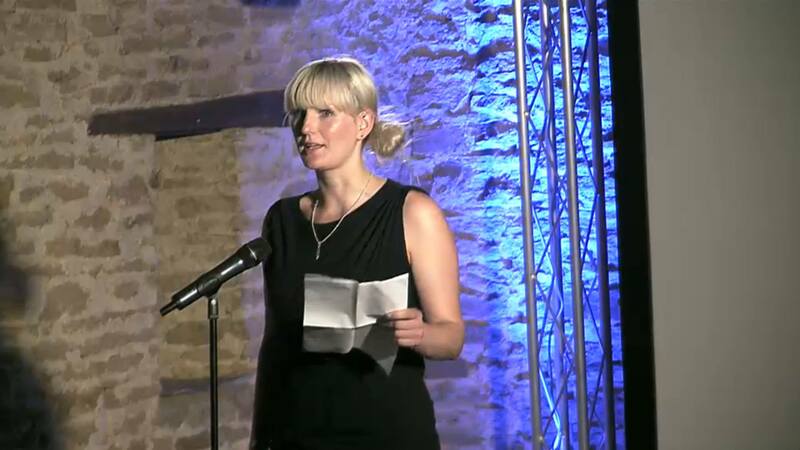 The nominator says the programme contained some of the most emotive images he had seen. 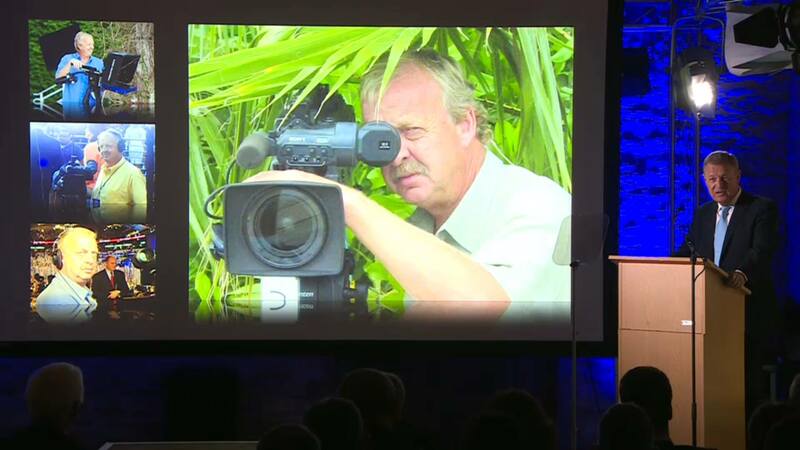 The cameraman, Darren Conway, was awarded an OBE this year for his services to British broadcast journalism. 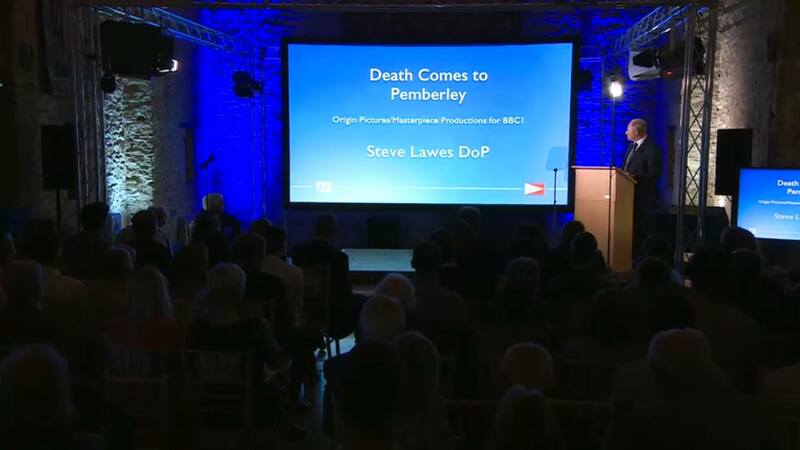 Huge respect to Darren (Cameraman, Producer and Director), correspondent Ian Panell and Editor Gary Bleeders who together offered us a beautifully shot but harrowing piece of viewing. An entertaining documentary transmitted on BBC1 in June around the anniversary of D-Day that mixed re-enactments, modern day location work and models that together combined to make an extremely well shot work of the highest standard. The nomination cited fantastic and powerful imagery, there was a very high quality feel to the whole programme. Slo-mo was used to really enhance the emotion felt by the viewer during the reconstructions rather than just to show off a fancy toy. The Director of Photography was Neville Kidd. Now a costume drama shown over three nights at Christmas on BBC1, like so many costume dramas the BBC does really well, but this one the judges thought was beautifully shot at locations around the country including York, Castle Howard in Yorkshire and Chatsworth House in Derbyshire. The voting panel made particular mention of the night sequences as being of the very highest standard. And the nomination went further – the cinematography of Director of Photography Steve Lawes was outstanding, with the night lighting on Episode 1 exquisite well controlled and believable. Steve captured the atmosphere. 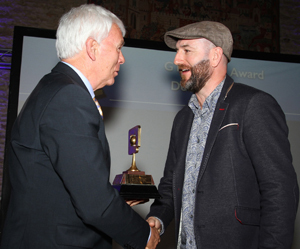 Unfortunately Steve is working in Sydney at the moment, so we will send his Award to him. How do you make another cooking programme both good TV, instructionl and a pleasureto watch? We’d say, use Andrew Smith as your Lighting Cameraman as this series demonstrated – excellent close-up work and lighting gave the editor some lovely sequences to use in making this a recipe for success (groan!). The nomination states that there was a high quality of lighting, slow motion and time-lapse shots with controlled and varied depth of field throughout the series that delivered a stylish, well-crafted example of excellent camerawork. 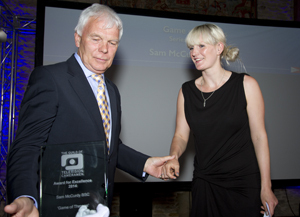 Here to receive the Award is Lighting Cameraman Andrew Smith. Now to a Show we have all seen at some point and which receives more than it’s fairshare of programme bashing but last year’s Eurovision . Production from Malmo in Sweden had some of the most inventive and excellently shot sequences we have we have seen to date, although last week's Show from Denmark was also extremely impressive. The nomination puts it very simply - probably the best Eurovision Song Contest we have seen, stunning camera moves and camera work. 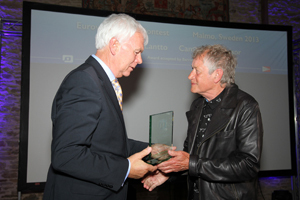 Unfortunately Senior Cameraman Per Olof Lantto is in Spain doing another series for Swedish TV but here to collect the trophy is a winner from last year, Barrie Dodd who led the crew on one of the most spectacular, demanding and well planned events in living memory, the Olympic Opening Ceremony. Shooting under some of the most uncomfortable circumstances in a Borneo jungle never makes for the easiest of location shoots but our next winner still came up with very high production values using first class handheld sequences, crane shots, studio work and even a motorized rickshaw to get some great reactions from locals. The nomination listed some excellent pictures in a fascinating production captured under extreme conditions. 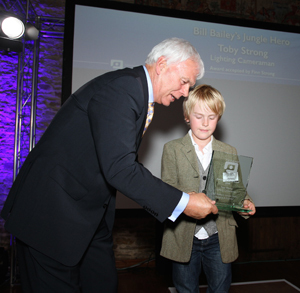 Lighting Cameraman Toby Strong had been called away to cover poachers in Togo, but instead his son eight-year-old cameraman stepped up to collect the trophy and make a very accomplished speech on behalf of Toby. 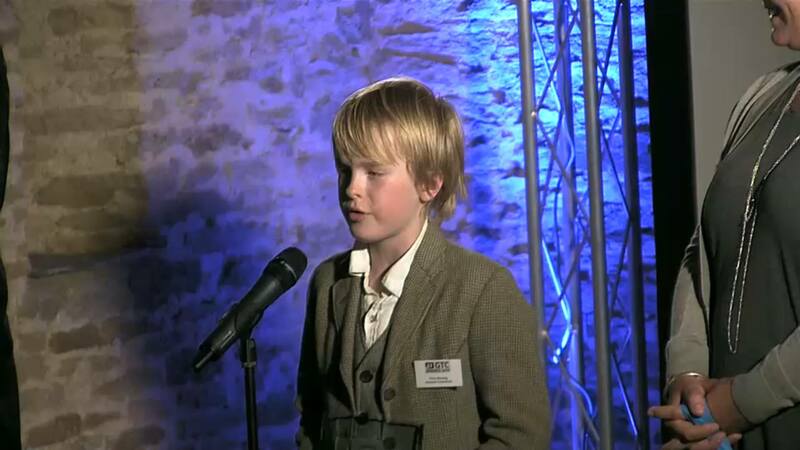 Questioned by GTC Chairman Keith Massey, Finn confirmed that he would definitely like to follow in his dad's footsteps and become a cameraman. The next award is unusual in that it isn’t for one programme, but for a group: The ITVLondon Studios Camera Department. 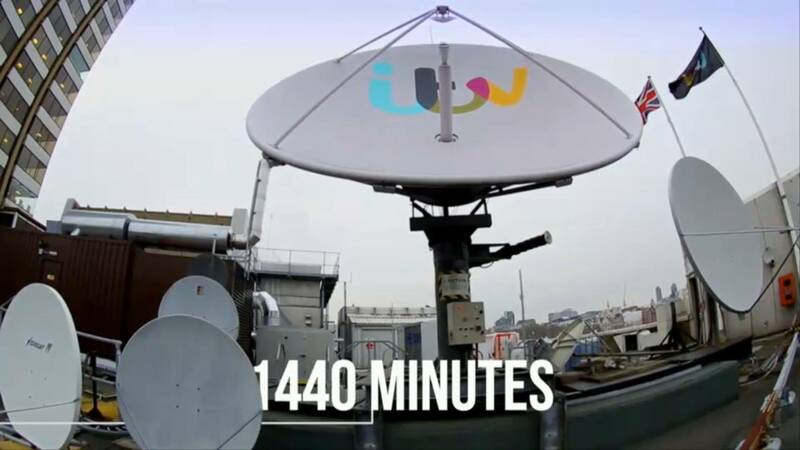 The nomination was made for the exceptional contribution to TV and to acknowledge the number of programmes that come out of one site for ITV and BBC in an average week, all of the very highest standard. Taking one week as an example, the department crewed: five Lorraines, fiveThis Mornings, five LWs, five Paul O’Grady’s, six QIs, one Europa Live Final, eight IPL Indian cricket matches, editions of Have I Got News For You, five News Hours, five Good Morning Britains, Alan Carr Chatty Man plus a Michael Flatley Music and Dance Special – a grand total of 114 hours of TV. Not only that but they also record the Loose Women, Surprise Surprise, Graham Norton and Jonathan Ross Shows. 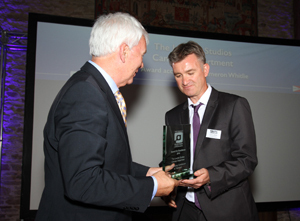 There to collect the Award on behalf of the department was Senior Cameraman Cameron Whitlie. 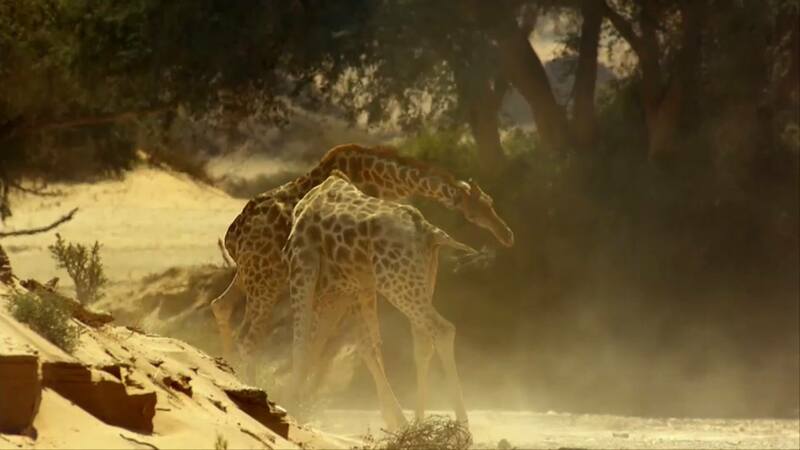 January and BBC1 brought us AFRICA from the BBC Natural History Unit in Bristol which in itself is a world beater. The first major series of 2013 to come from that stable included some remarkable footage never before witnessed by the viewer. 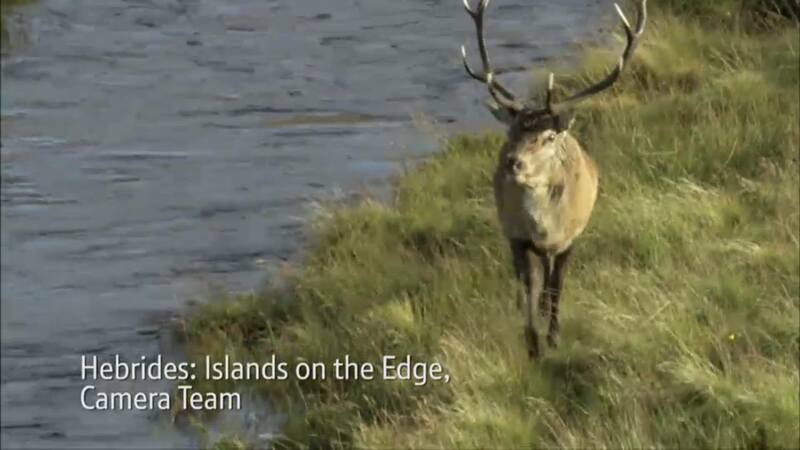 The judges made special mention of the range of camera mounts that were used on this extraordinary series, cranes, planes, hot air balloons, Steadicam, tracks, macros, GoPros, radio camera, nightvision, underwater as well as good old hand helds. The coverage was a credit to the whole team. 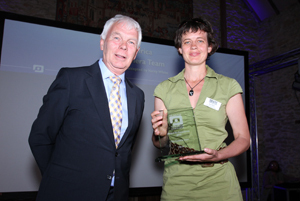 There to collect the trophy on behalf of the whole team was Verity White. "Over the last few years, the noticeable move in television drama to now trust and listen to DPs and allow them to truly work a script and take it from the page to the television, in a way that was normally only open in cinema, is something to be enjoyed and should be constantly fought for. Too often as storytellers, we’ve been told that all TV drama has to follow a certain language and made in a certain way. But when you look at TV at the moment it seems we are enjoying a belief that we can live outside those rules. When we are allowed to use our craft to truly interpret a story in a way that is right and not just because of what has gone before, it is always a far better piece. I truly hope that we can continue in this vein and that producers and directors will constantly look to listen to and question their DPs to achieve what is right for their stories." The last Award returns to music and live coverage on ITV1 but this time on location at Wembley arena. We have become used to inventive shooting of the highest standard on the X Factor from Fountain Studios but the 2013 live final moved everything up a gear. New angles, new mountings, all completely live in a one-day shoot that was a credit to all the crew. 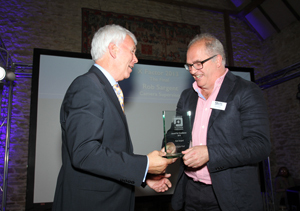 There to accept the Award was Senior Cameraman for the last two series, Rob Sargent. Back in 2011 Stuart McKears was becoming more and more concerned with the lack of teaching of camera skills in universities and further education so he started looking into a GTC-backed award for young film-makers and cameramen who had produced camerawork to an exceptional standard while studying. Stuart was fortunate enough to spend some time with Bill Vinten who expressed an interest in starting a charitable body and funding an overall award winner and two runners-up for five years, offering recognition of students’ work and ultimately work experience with some of the best cameramen in the country to give the winners a real knowledge of today’s industry. The GTC members who offer the work experience also win as the students they support are dedicated and keen. The universities win, as they gain recognition for their teaching and mentoring and the GTC wins through links with the educational establishments and new associate members coming on board. 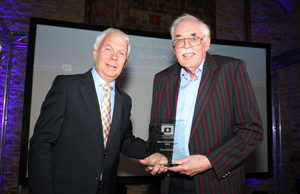 Stuart is awarded the Mike Baldock Award for his tireless promotion of the GTC and the Television and Video Camera Craft Educational Trust. In recent years, the GTC Forum has grown to become an essential GTC service, even a selling point that attracts new members. Perry Mitchell has been the ‘font of all knowledge’ for anyone requiring technical answers from the Forum. He can be relied upon to give accurate, helpful hints on almost any aspect of TV cameras. Often entertaining, he is never dull in relaying his knowledge and experience. He has a gift of corresponding in an unassuming way that ensures the person asking the question is never made to look stupid; quite the reverse in fact, Perry seems to regard all submissions as interesting challenges to be solved. For his admirable contribution to the Forum and, in turn, promoting the work of the GTC, Perry Mitchell is awarded Honorary Membership. 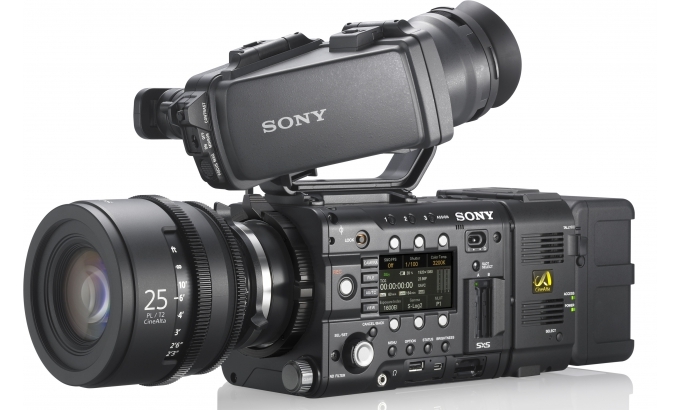 With the new fashion for large-sensor cameras, the Sony CineAlta F5 burst onto the scene in October 2012, together with its older brother the F55 and took 2013 by storm, with many cameramen world-wide making it their camera of choice for documentary and sport. The F5’s popularity is due to its small, light and modular body; CMOS super 35mm sensor, build quality, excellent colour LED or OLED monocular viewfinders and value for money. It records onto SxS Pro and XQD cards via an adapter as well as AXSM cards. It has the ability to record slow motion at 120 frames per second and a quick and easily accessible push button external menu system. It can record up to 2K internally in XAVC or HDCAM HD codecs. It will record 16 bit Raw onto 2K/4K with AXSM media onto the optional bolt-on AXS-R5 recorder. All these factors are important but the main critical question is: 'What is the picture quality like?' The answer is that the F5 produces absolutely stunning pictures and boasts a 14-stop latitude, when used with the right gamma table and codecs. The F5 is well supported by SONY, as it reacts to customer requests, by adding additional features via firmware upgrades. One such example is the option to record Apple ProRes, Avid DNX files and 4K. At the recent NAB in Las Vegas, Sony announced a list of new accessories, including a bolt-on unit that configures the body to feel like a shoulder mounted ENG/EFP camera. It puts the switches and audio inputs in places a cameraman would expect to find them on 2/3 inch camera bodies. The F5 supports thousands of lenses through a variety of adapters including industry standard PL cinema lenses. 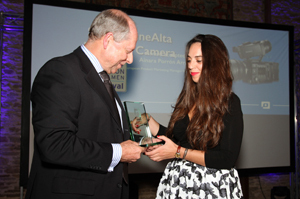 The GTC Seal of Approval for the Sony CineAlta PMW F5 was received by Ainara Porrón Arratibel. Former GTC Chairman Graeme Mcalpine wrote: "I nominated the Hero 3 Black Edition camera, because, for me, it epitomises the way that GoPro cameras have revolutionised the way we can capture footage." GoPro has more than 10 years' experience in manufacturing extreme sports and adventure cameras, and the Black Edition was the flagship product in the Hero3 range when it was nominated. 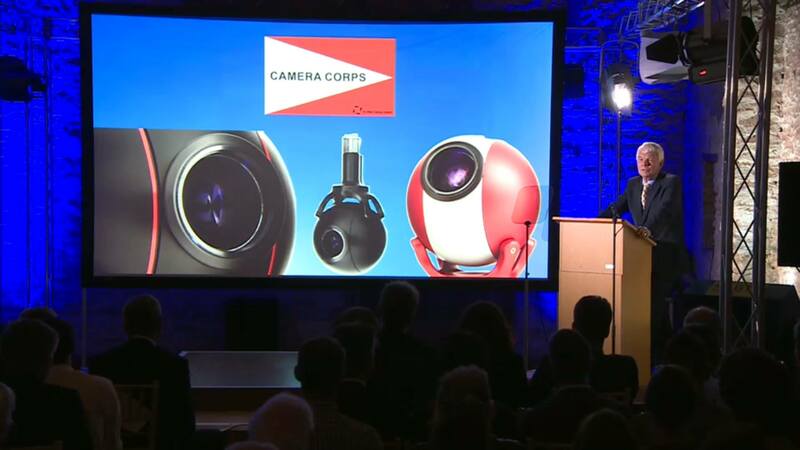 The camera is specifically designed to be used outdoors in the kind of conditions that would wreck regular cameras. The additional waterproof polycarbonate housing is good to a depth of 60 metres and guards against bumps, scrapes and occasional drops. With its ultra-wide fish eye lens and wi-fi remote function it is excellent for action videos. It is a small, but tough camcorder designed to be used in the harshest of conditions, with a wide variety of available mountings. The black edition can capture 1080p Full HD video. It has a beefed up high resolution 12MP camera with time lapse mode. The latest version also includes a Bluetooth remote control and can shoot at up to 4K resolution. It all adds up to plenty of scope and flexibility for the cameraman. 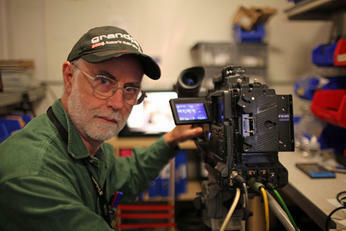 For Graeme, he describes it as the Bolex H16 of the 21st century. Make a nomination for 2015 now!